Re: No Servers are popping up! Hello FBinfantry, welcome to the forums. 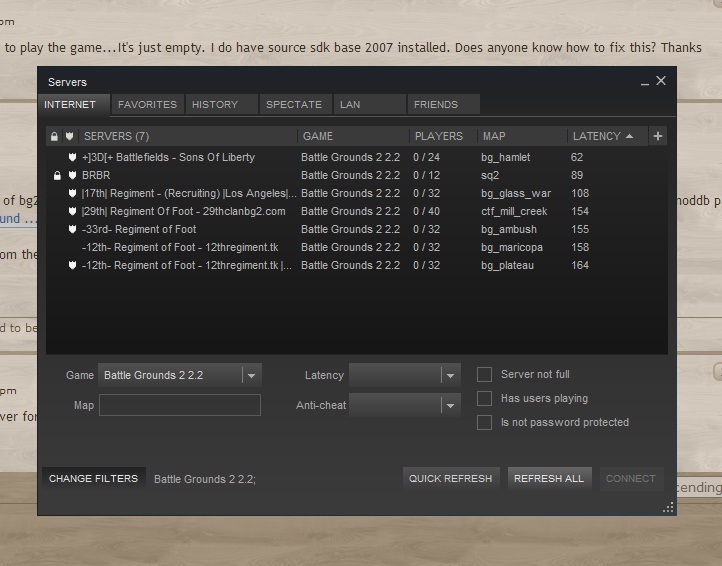 I checked on steam and there was one server for battlegrounds but there were no people in it? Is that the ONLY server? No, there are seven last time I checked, the most popular ones being 12th, 29th and 33rd. Here is a screenshot of what my server browser list looks like. That being said the majority of players tend to be European, and peak play times are during European hours. If you keep having issues I can get you the server IPs and you could connect directly through the dev console. Ok...I see them, Thanks! I will find the european times and make sure they're not to crazy to play at.